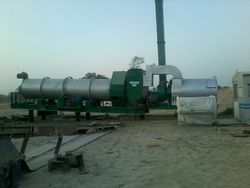 We are one of the leading manufacturers and suppliers of a qualitative range of Hot Asphalt Drum Mixers. These are fabricated using quality raw materials and advanced production technology. Our range is widely acclaimed by our clients for superior quality and high performance features and is available at competitive prices. We are engaged in offering our clients with a qualitative range of Hot Asphalt Drum Mixers. Our range is designed and fabricated using quality raw materials and in accordance with the set industry standards. We also offer these mixers in varied specifications as per the requirements of our clients and at competitive prices. Looking for Hot Asphalt Drum Mixer ?